This fifth and final release of Cortot’s 78rpm Chopin recordings is surely the jewel in the crown. Here, the 1929 rather than the more familiar 1933 set of the Ballades blazes with a passion, brilliance and poetic audacity that set the pulse racing and the mind reeling. Here is a great artist who seized the opportunity to achieve ever greater heights of eloquence and rhetorical verve. Superbly restored by Mark Obert-Thorn, every performance is charged with a heady and consuming poetry that confirms Daniel Barenboim’s claim that ‘Cortot discovered the opium in Chopin’. Take the First Ballade’s opening, where Cortot is every inch the bardic poet, free, rhapsodic and inimitable; or hear him in the Presto con fuoco storms of the Second Ballade, where he plays as if pursued by the furies of hell. Again, even when inaccuracies fly in all directions in the heat of the chase, no other pianist has approached the Third Ballade’s central C sharp minor turbulence with such daring or recreative force. Cortot was never one to hold back in the interests of decorum and in the Fourth Ballade he stretches the parameters of Chopin’s poetry to the very edge, his playing close to being consumed in its own ecstasy. His selection of Nocturnes (sadly his projected Chopin survey was never completed) pulse with the same alluring quality, suggesting the reverse of Rubinstein’s more patrician elegance. True, for today’s more antiseptic and ‘tasteful’ practitioners such artistic conviction and originality will seem extravagant or even camp. Yet there is surely no living pianist who could or would attempt to emulate such heart-stopping poetry. Maria Callas herself would have been among the first to pay tribute to Cortot’s cantabile, an unequalled ‘singing’ at the piano. Perahia brings order and lucidity to the heart of Chopin’s most audacious fire-storms and in, for example, Etudes Nos 1 and 4 from Op 10, you’re made aware of an incomparable mix of poetry and precision. Perahia’s may be a wholly modern voice yet he truly speaks in the spirit of his revered masters of the past, of Cortot and Fischer in particular, and this, allied with his immaculate, infinitely polished and shaded pianism, gives his performances the rarest distinction and quality. How superb and unfaltering is his mastery in No 1, that magnificent curtain-raiser to Op 10, how magical his improvisatory touch in its closing page. His textural translucency and musical breathing, hisrubato in No 3, like that of Rubinstein, is that of a great and natural singer of the keyboard. Chopin would surely have cried out once again, ‘ah, mon patrie!’ if he had heard this performance. No 8 is delightfully rumbustious, and just when you note a touch of evasion in his rapid spin through the morbid near-Wagnerian chromaticism of No 6 you find yourself relishing his cool tempo, a musical ease and flexibility that give new meaning to Chopin’s prescribed con molto espressione. On the other hand No 7 from Op 25 unfolds with the truest, most memorable sense of its lento elegy. And where else have you heard a more impassioned or articulate Revolutionary Etude? Perahia’s is the finest of all modern discs of the Etudes, and Sony’s sound captures all his artistry. The 24 Etudes of Chopin’s Opp 10 and 25, although dating from his twenties, remain among the most perfect specimens of the genre ever known, with all technical challenges – and they are formidable – dissolved into the purest poetry. With his own transcendental technique (and there are few living pianists who can rival it), Pollini makes you unaware that problems even exist – as for instance in Op 10 No 10 in A flat, where the listener is swept along in an effortless stream of melody. The first and last of the same set in C major and C minor have an imperious strength and drive; likewise the last three impassioned outpourings of Op 25. Lifelong dislike of a heart worn on the sleeve makes him less than intimately confiding in more personal contexts such as No 3 in E major and No 6 in E flat minor from Op 10, or the nostalgic middle section of No 5 in E minor and the searing No 7 in C sharp minor from Op 25. Like the playing, so the recording itself could profitably be a little warmer at times, but it’s a princely disc all the same. I could go on picking out highlights from each study – the question-and-answer voicing in No 9, the subtle rubato in Op 25 No 1, the infamous studies in thirds and sixths in which, simultaneously, Chochieva reminds us of Chopin the contrapuntalist – moments and passages which made me listen afresh to these familiar works and, in some cases, hear things of which I had been previously unaware. The greatest on disc? I don’t know; but it is certainly one of the most consistently inspired, masterfully executed and beautiful-sounding versions I can recall. When, if ever, have you heard the Chopin Etudes played as pure music, given as naturally as breathing yet recreated from an entirely novel perspective? From Jan Lisiecki, Chopin’s poetic essence, hidden beneath every thorny, relentlessly focused problem, emerges with an inimitable subtlety and elegance. Lisiecki gives us tone-poems first and studies second, his technique as unobtrusive as it is effortlessly fluent, lissom and precise. Take Op 10 No 1, from Lisiecki a grand maestoso curtain-raiser that transcends a more familiar and determinedly virtuoso rush. No 4 is brilliantly articulate rather than manic or blistering (re Cziffra and, it has to be said, Richter and Argerich). What quiet, scintillating charm in No 5 (the ‘black keys’ etude), what intuition in the agitated short-long-short phrases of No 9. Rarely have I heard a more assured left hand in the cadenzas or flourishes of Op 25 No 7 (and this within the context of a magically confided reading). No 8 (sixths) is playful and giocoso, while in No 10 (octaves) Lisiecki shows himself no stranger to strength and drama when Chopin is in his stormiest B minor mood. Yet overall it is the luminous quality of his musicianship that strikes you at every turn. DG has struck gold and I can only hope that such a perceptive, natural and unforced talent will remain untarnished by commercial pressures. Never for a moment would I want to be without celebrated recordings by Cortot, early Pollini and Ashkenazy and Perahia, but for a memorable musical recreation Lisiecki stands alone. Evgeny Kissin’s playing at 21 (when these performances were recorded) quite easily outmatches that of the young Ashkenazy and Pollini – most particularly in terms of the maturity of his musicianship. The programme launches with a reading of the great F minor Fantasie, which, though a bit measured, is integrated to perfection. The power and determination of the performance certainly make one sit up and listen, but at the same time it would be difficult not to be moved by the heartfelt lyricism of the melodic passages. Although Kissin may be a little unsmiling in the three Waltzes, at least he has admirable sophistication in being able to add interest to the interpretations. His control in the tricky A flat, Op 42, is quite amazing. The Nocturnein C sharp minor is a jewel. This reading is among the most darkly imaginative and pianistically refined on disc. The disc ends with a powerfully glittering performance of the Second Scherzo. Recording in the studio, rather than at a live concert, quite naturally leads to a safe and uniform approach, which doesn’t really serve the inspired inventiveness of the music. In some ways these recordings suffer from this. If you compare Rubinstein’s readings here with those he recorded on 78rpm discs in 1938-39, you immediately notice that an element of fantasy and caprice has given way to a more sober view of the music. The Mazurkas are so intricate in their variety of moods that the successful pianist has to be able to treat each one as an entity, contrasting the emotional content within the context of that particular piece. Rubinstein, with his serious approach, lends the music more weight than is usual and he wholly avoids trivialising it with over-snappy rhythms. With him many of the lesser-known Mazurkas come to life, such as the E flat minor, Op 6 No 4, with its insistent little motif that pervades the whole piece. His phrasing is free and flexible and he has utter appreciation of the delicacy of Chopin’s ideas. He doesn’t, however, take an improvisatory approach. Rubinstein judges to perfection which details to bring out so as to give each piece a special character. He convinces one that he has made this music his own. When you hear Rubinstein tackle the C sharp minor Mazurka, Op 53 No 3, you at once know that he fully comprehends the depth of this, perhaps the greatest of them all. He ranges from the pathos of the opening to a persuasive tonal grandeur in the more assertive parts, and yet is able to relate the two. The recording has a number of blemishes: the piano is too closely recorded, the loud passages are hollow-toned, especially in the bass, and there is little sparkle to the sound. It’s controversial to say so, but such playing makes a mockery of present-day standards. All these performances prove that Rubinstein played the piano as naturally as a bird flies or a fish swims. He was simply in his element, and never more so than in Chopin. Who else has given us the Nocturnes with such ravishing inwardness, pianistic sheen and a bel canto to rival the finest singer? Decorative fioritureare spun off like so much silk, and whether or not you consider Op 15 No 2 ‘inseparable from champagne and truffles’ and Op 27 No 1 a portrait of ‘a corpse washed ashore on a Venetian lagoon’, or hear the nightingales of Nohant in Op 62 No 1 and the chant of the monks of Valdemosa in Op 15 No 3 and Op 37 No 1, you can hardly remain unaffected by Rubinstein’s unique artistry. 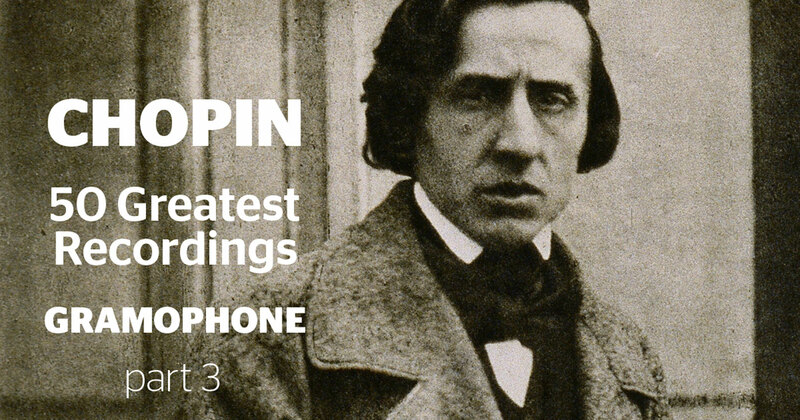 His feline ease in the double-note flow of Op 37 No 2, or the way he lightens the darkness of the great C minor Nocturne without losing an ounce of its tragedy, all form part of the genius that made him the most celebrated of all Chopin pianists. Rubinstein’s Mazurkas are equally the stuff of legends. Chopin’s most subtle and confessional diary, they transcend their humble origins and become in Rubinstein’s hands an ever-audacious series of miniatures extending from the neurasthenic to the radiant, from Chopin’s nagging child (Op 17 No 3) to the unfurling of proud ceremonial colours (Opp 63 No 1). What heartache he conveys in Op 63 No 3; and when has Op 67 No 3 been more intimately confided, its banal association with Les sylphides more blissfully resolved? Chopin’s final composition, Op 68 No 4, becomes a valediction encouraging rather than forbidding weeping, Rubinstein’s rubato the caressing magic that created a furore at his unforgettable recitals. Finally the Scherzos, played with an outrageous but enthralling disregard for safety. Only a pedant will underline the odd mis-hit or pock-mark in the context of such sky-rocketing bravura and poetic impulse. As an added bonus there are additional recordings of three Mazurkas and two Waltzes, the A flat Op 34 No 1 alive with dizzying virtuoso trickery. The booklet-note writer may comically mistake the Mazurkas for the Polonaises in referring to Schumann’s oft-misquoted description, ‘guns [sic] buried in flowers’, but that’s a mere spot on Naxos’s blazing sun. No more life-affirming Chopin exists. Vladimir Ashkenazy made his integral set of the Mazurkas over a decade. He has always played outstandingly. He does so again here, giving complete satisfaction. The set includes all those published posthumously and the revised version of Op 68 No 4, so this is a comprehensive survey. Ashkenazy memorably catches their volatile character, and their essential sadness. Consider, for example, the delicacy and untrammelled spontaneity with which he approaches these works. He shows the most exquisite sensibility, each item strongly though never insistently characterised. His accounts of the Mazurkas of Opp 6 and 7, for instance, offer a genuine alternative to Rubinstein. Nine pieces in all, they were Chopin’s first published sets and their piquancy, the richness of their ideas, is here made very apparent. One is given a sense of something completely new having entered music. Although there are fine things in all the groups, Op 24 is the first Mazurka set of uniformly high quality and No 4 is Chopin’s first great work in the genre. On hearing them together like this one appreciates the cumulative effect which the composer intended, and Ashkenazy makes a hyper-sensitive response to their quickly changing moods. The recorded sound has the warmth, fullness and immediacy typical of this series, with a nice bloom to the piano tone.